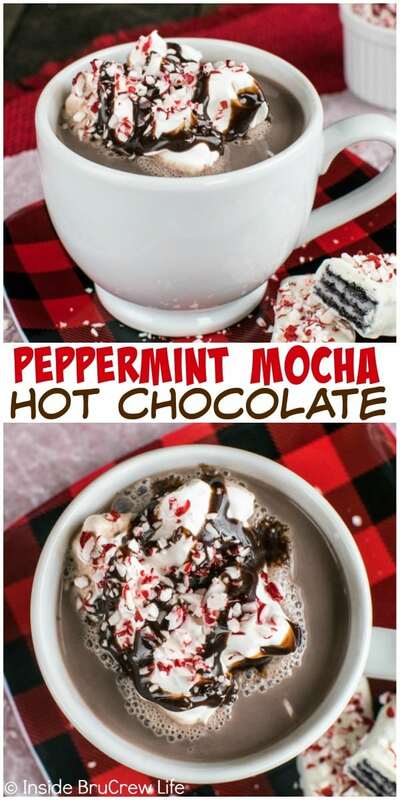 Sipping on a big mug of Peppermint Mocha Hot Chocolate is a delicious thing to drink in the winter. 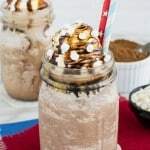 Chocolate, coffee, and peppermint swirl together and make you feel warm and toasty, no matter what it is doing outside. One thing that I have been doing with my daughter since she was younger is a coffee date. We used to go for coffee and shopping more often, but she started expecting it, and all those coffees start to add up over time. Now I randomly choose a night every few months, and she is surprised when we go for a cup of coffee and some quality shopping time together. Shopping and coffee time is definitely the way to my daughter’s heart. I’m so glad she enjoys the same things I do. It makes mother/daughter bonding so much easier for both of us. Just the other day she said she wanted to take me out for coffee. I can’t wait for that date! Yay for her getting old enough to pay! I need to teach her how to make homemade coffee treats now that she is getting older. I am always looking for ways to teach her how to spend her money wisely. Going out for a special drink every once in a while is not a bad thing. But if you learn to make them at home, then you can enjoy those specialty drinks a little more often. One of my favorites to make at home is this Salted Caramel Mocha Latte. Recently I had the opportunity to spend a little bit of time at a food conference where I met the girls from Ninja®. They were showing off the new Ninja Coffee Bar™. A coffee machine that does it all? Consider me intrigued. I was all ears as they showed us how it could brew a full pot, brew a single cup, brew over ice, and brew strong coffee for special drinks. My husband and I drink quite a bit of coffee at home as well, so I was very interested to learn all about it. It sounded like the perfect gift for our household. After I went home, Ninja® contacted me and asked if I would like a machine to review and share. Yay! My coffee drinks are so excited for all the fun we are going to have now. I love how easy the Ninja Coffee Bar™ is to work. It has buttons for all the different drinks you want to prepare and a booklet of easy to make recipes for each button. 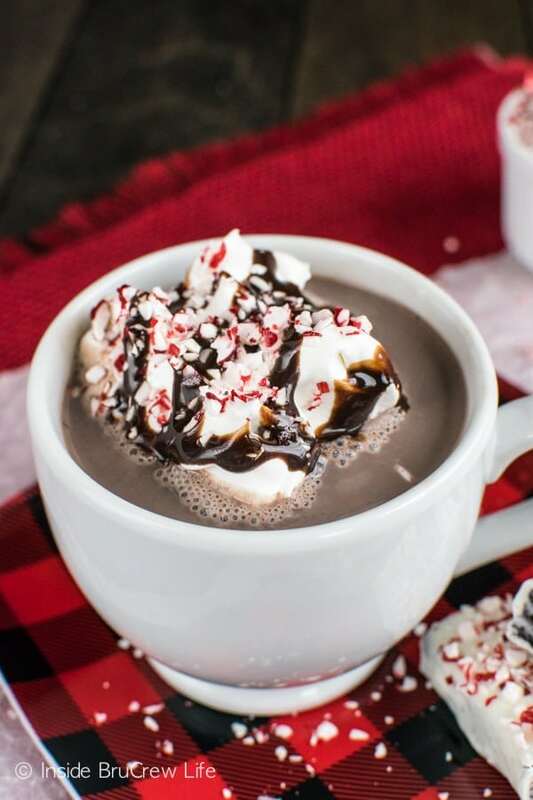 With my love of chocolate and peppermint still going strong, I knew it was time to create a peppermint mocha hot chocolate for me to sip on while working in the afternoon. Anyone else hit a wall right about 2 pm? 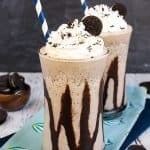 This drink is the perfect pick-me-up! 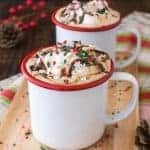 A little bit of cocoa powder, a few spoonfuls of crushed candy canes, milk, and strong coffee makes the easiest homemade drink you ever need. I suggest getting in the kitchen and making one right away. I have a feeling it’s time for another drink here too. 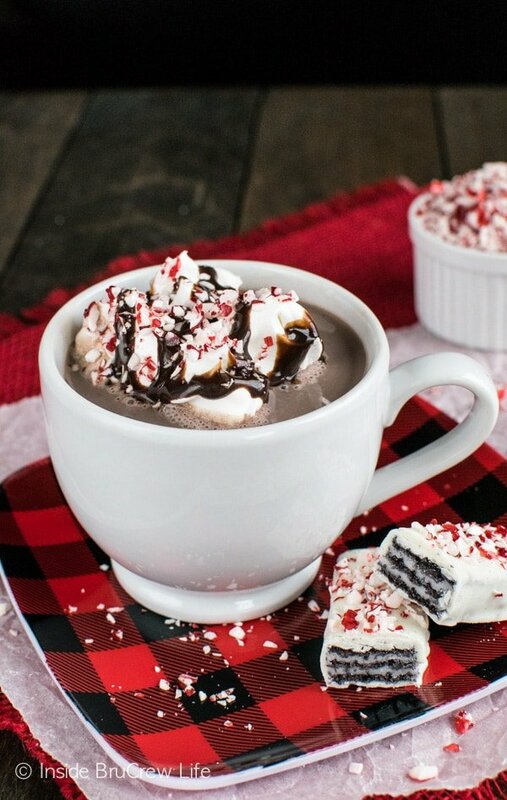 Cocoa powder and peppermint candy cane pieces melted into milk and coffee makes this Peppermint Mocha Hot Chocolate so delicious. Perfect to enjoy on a cold day! 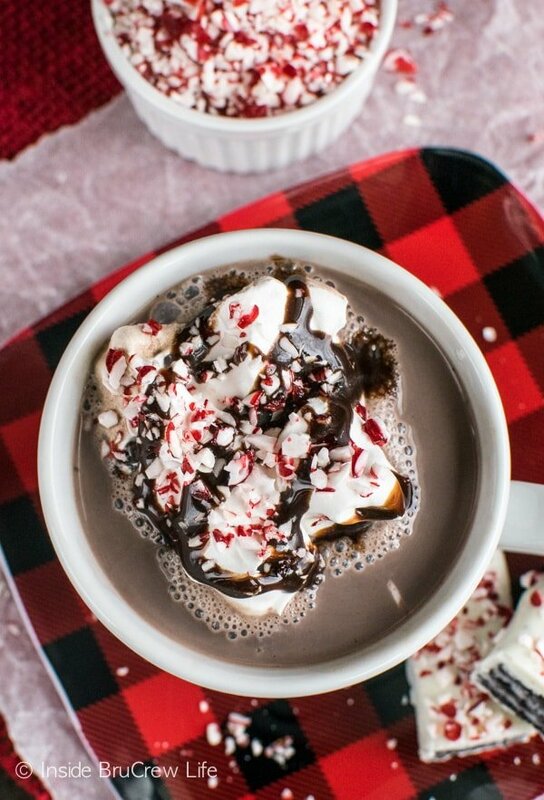 Whisk together 2 Tablespoons milk, cocoa powder, and 2 Tablespoons candy cane pieces in a small saucepan. Heat over low-medium heat until melted. Whisk in the rest of the milk and heat until hot. Stir in the strong coffee. Pour into 1 large mug or 2 small mugs. Top with Cool Whip, syrup, and extra candy pieces if desired. Serve immediately. 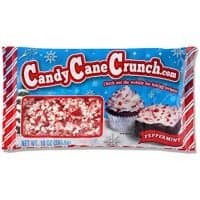 *You can also use 2-3 Tablespoons of sugar and 1/4 teaspoon peppermint extract in place of the peppermint candy cane pieces. 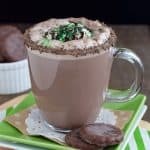 **For a richer cup of cocoa, use half & half in place of the milk. *Inside BruCrew Life was provided with a Ninja Coffee Bar™ to review. No other compensation was given. All opinions are 100% my own. Thank you for letting me share products and brands that we love. *This post also contains an affiliate link. We receive a very small percentage of sales made through these links. This looks delicious! I’ve never had a peppermint mocha, would you believe it? Is it wrong of me to say that if I won this fabulous gadget I’d keep it for myself? 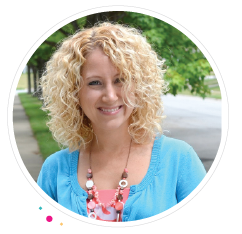 I’m a mom to two young kids and I’m also a first grade teacher, so I drink coffee all day, every day. Thanks for the opportunity, and I’m so happy to have found you! Would give it to my best friend!!!! She loves coffee and would love this!!!! If I won this, it would be “Merry Christmas to me”!! I would gift this to my husband who is a huge coffee drinker! I would give it to my mom, but wouldn’t be upset at all if she insisted I keep it!!! Sweet and warming.. perfect drink in winter! I would give it to my best friend, who’s the only person I know more obsessed with coffee than I am! I’m afraid I’d be stingy and keep it for myself! I would gift to my parents. They love their coffee and are in need of a new coffee pot. And my mom having cancer and so many financial issues this year, this would be perfect!! As much as I’d love this for myself, I’d gift it to my mom! She loves coffee as much as I do and is the most selfless woman I know! I was actually looking into buying one of these for my in-laws for Christmas but would love to win it! Thank you! I would gift it to my daughter and her husband. Oh my goodness. I can’t imagine the possibilites with this machine! I would give this to my son, Mark! He’s a coffee afficionado and a really, really hardworking student! When I saw your post in my mailbox today, I almost cried. I am disabled, and it’s a challenge for my husband and I to get out. We both love coffee drinks. So, I would give it to my Husband. Alleviate the difficulties he has to deal with to go out. If I won this I would gift it to myself and my husband we love coffee. In this case I think I’d keep it for our family. My husband has food allergies and can never get drinks or food outside of the house. It would be so nice to whip him up something like this once in a while and have it taste like the pros! If I won this i’d gift it to my son’s girlfriend, she’s going to college and buys starbucks everyday. I’d like to see her save some money. I’d gift it to my mom, that’s for sure. I would gift it to myself! 🙂 My husband and I have been wanting one of these since we saw it! I would absolutely positively give this gift to my husband!! I would gift this to my husband! I would gift this to myself and retire the old coffeemaker we have at home. Thanks for all of the great posts, I look forward to them. I wish I had time to try baking everything on this site. Yum! 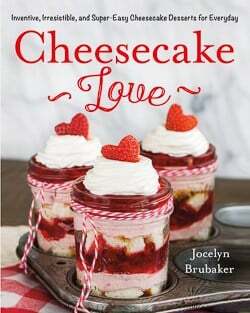 and love to try new recipes so this would have my name on it under the tree! I would have to admit this would be in my kitchen! The photos in this post are outstanding!!! 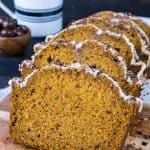 Love the details, and the recipes are a hit in our home!!!! 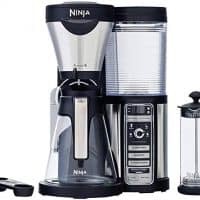 If I won, I would probably donate the ninja to my church, but there is the possibility I would want to try it out a few times first , as coffee is our #1 drink. I would gift this to my daughter. Or I might just have to keep it for myself, but she really needs it!! I’d gift it to my son-in-law. He drinks a tremendous amount of coffee every day and especially likes flavored coffees. 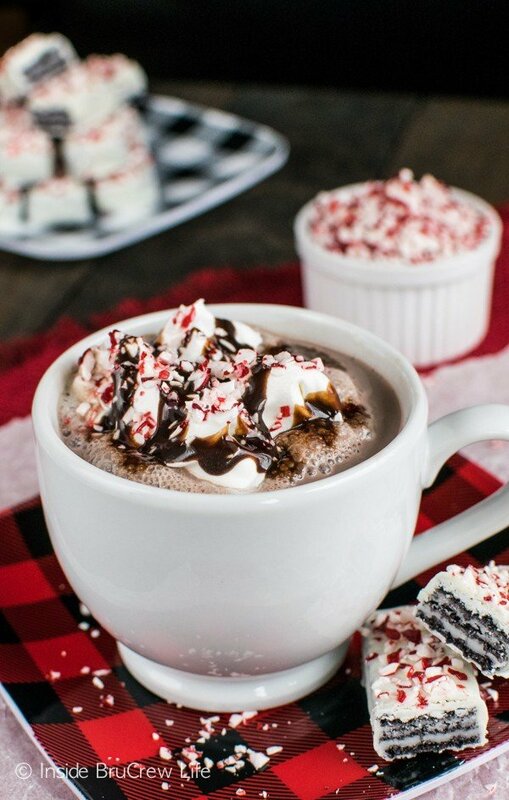 I’m going to surprise him with your peppermint mocha hot chocolate Christmas morning. He’s going to loooooove it! My son the college student. I would not gift this as I would use this daily to make my coffee drinks. This would save me so much money from visiting the baristas weekly. I would give it to my husband for Christmas and this way I can reap the benefits too!!!! Looks so cool! I would gift this to my mom as she loves coffee……. If I win this, I’m gifting it to ME! I’m the biggest coffee lover I know! I’d definitely be gifting it to me! My boyfriend’s mother. She loves her morning coffee and her maker is 30+ years old! Hmm, it would be a very hard decision on who to gift it to. Almost everybody I love, loves their coffee. Maybe I would keep it so when they came to visit, they could all have awesome coffee! I would gift it to my great co-teacher friend. We work together every day and she is such a blessing to me! Would love this for the family, but would probably ship it from Arizona to Wisconsin to one of my daughters that live back there in my homeland. Love my coffee, but 2 of the 3 have children and are working mommies, so…. OMG I am definately a giver but this one i would have to keep. I love it and its all i want for Christmas. Thanks for the chance to win. 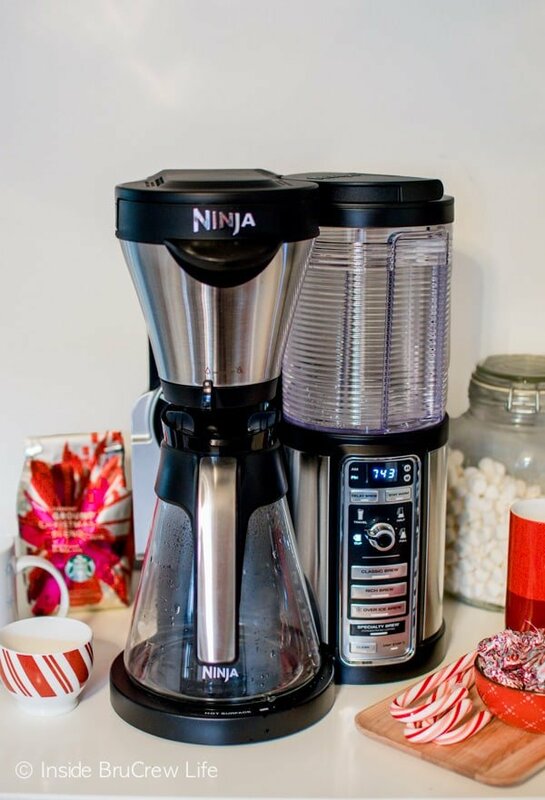 If I won the Ninja coffee bar I would consider it a gift for my husband and I! I would gift this to my dad if I won! Thanks for the giveaway! I would gift it to myself!! My daughter who is leaving the nest. She’ll be starting from scratch and a Ninja Coffee Bar would be perfect for her new nest. I would gift it to my neighbor. She’s a new mom and I know she needs all the caffeine she can get! I like to give things away, but I would keep this one. i love coffee! I would gift this to my mother-in-law. 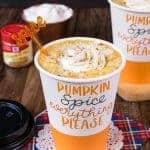 She’s a HUGE coffee lover, and this just might win me over!